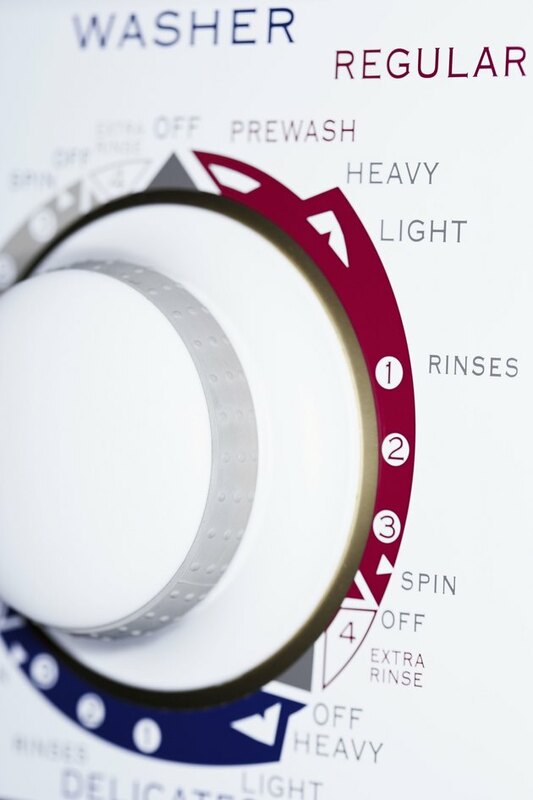 A washing machine's spin speed can vary by type and model. Generally speaking, most front-loading washing machines spin at faster speeds than top-loading washing machines, yet actual spin speeds differ based on model. If you're considering purchasing a new washing machine or upgrading your existing one, it's helpful to know how fast a washing machine will spin; the faster a washer spins the clothes, the less dry time they will need. A washing machine’s spin cycle routinely lasts for up to three minutes. A standard top-loading washing machine can typically spin up to 800 revolutions per minute (rpm), according to the website Best Top-Loading Washing Machines. Other top-loading washing machines can spin as fast as 1600 rpm, although these models are usually more expensive. While spin speeds fluctuate by manufacturer and model, most top-loading washing machines have spin rates of about 800 rpm rather than 1600 rpm, which are rarer. The faster a washing machine spins the more water quits the laundry, cutting dry time. An advantage of front-loading washing machines is that they commonly spin faster than a top-loading washing machine. Most front-loading washing machines have spin speeds between 900 and 1200 rpm, according to Whirlpool. Certain front-loading washing machines will begin the spin cycle at a lower spin speed and gradually increase the rate of speed to "wring" clothes nearly free of water before the cycle ends. The faster a washing machine's spin speed, the more the washer will vibrate and the noisier it will sound during the spin cycle. A standard front-loading washing machine is therefore more apt to vibrate and make noise than the average top-loading washing machine models. Although there are ways to mitigate noise and vibration, like balancing the washer, installing it properly and avoiding overloading the machine, expect a front-loading washing machine to move more during the spinning cycle than a top-loading washing machine. Although a washing machine's spin speed should be a factor for deciding which washing machine to buy, it shouldn't be the only factor. Consider other aspects that a washing machine offers, such as load capacity, energy usage, wash time, noise level and price. In addition, if a washer's spin speed is less important to you, you may want to choose a model that offers two speed options. A washing machine with two speed options gives you more flexibility when selecting a wash setting, depending upon the laundry you're washing.